truthfully, it's just been a busy week. jeffrey was traveling all week. the girls had school. laney was sick. my papa flew in from texas to visit. my back is still bothering me. and so at the end of the day, when i normally sit down to write - i just wanted to go to bed. i made a goal for myself to take a picture a day for the entire year. my plan is to create a book out of them at the end of 2014 to have as a keepsake. we're only 18 days into the year, but so far - so good. 1.6.14 - no one can make liza laugh like her sisters can. she cracks up at those girls. 1.7.14 - it was a loooooong day stuck inside. too cold to get out. school was cancelled. 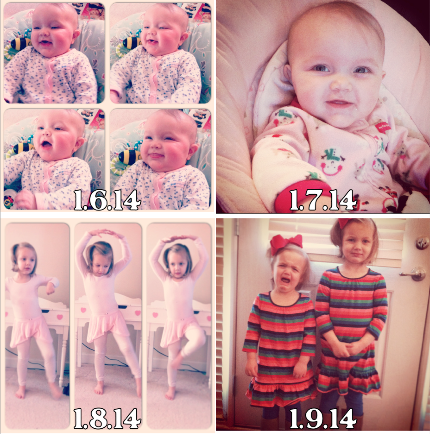 1.8.14 - libbi went back to school and back to ballet. 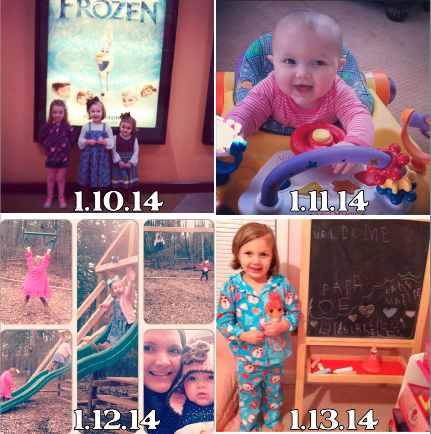 1.12.14 - the girls LOVE being outside. they could play outside all day. believe me, they don't get their love of the outdoors from their momma. 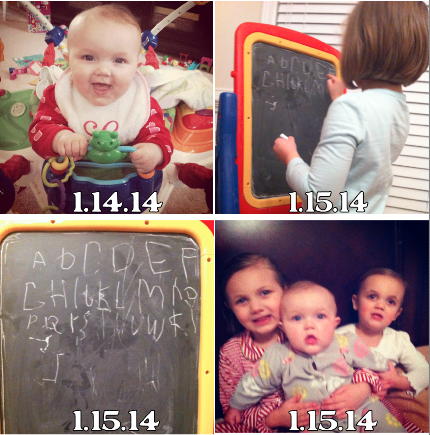 1.13.14 - libbi left a message for papa joe on the chalkboard at mimzy and buddy's house. she wanted him to see the "welcome" sign when he arrived from texas! 1.14.14 - liza is so happy to be in all her "big girl" toys now. 1.15.14 - love three freshly bathed babies! 1.16.14 - liza LOVES waiting for her big sisters in the carpool line. maybe it's because she gets to sit up front with me while we wait. 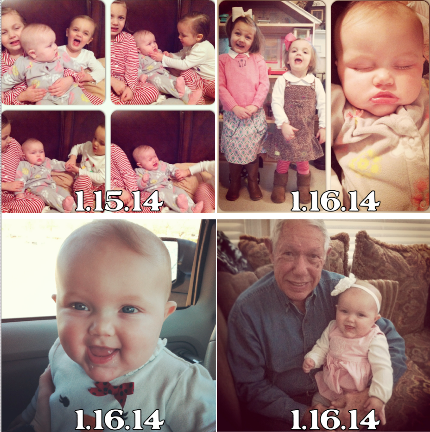 1.16.14 - papa joe is here from texas! 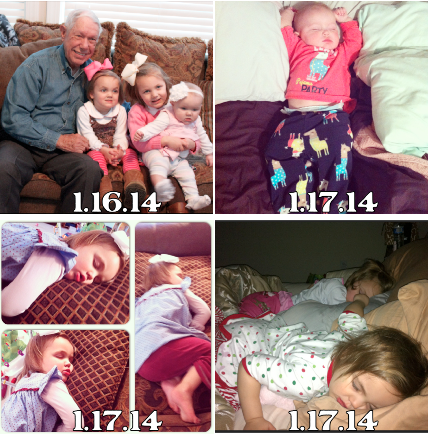 1.17.14 - apparently liza needed a little more sleep. she was up for the day and then promptly passed back out after breakfast. 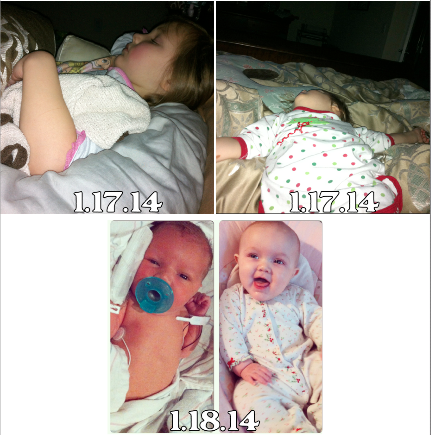 1.17.14 - poor laney has another nasty case of croup. the number one way to tell when laney is not feeling well: she's still. 1.17.14 - and this was laney. (in case you can't tell, she is sideways and upside down in the bed. asleep. she can make a king size bed feel like a twin.